Make an investment that makes a difference. Every dollar we receive is applied to spreading awareness, providing education and creating a stronger community for those affected by social anxiety. In an effort to make the widest impact possible, AKFSA is now partnering with established, national mental health organizations to expand our audience and capabilities. Your donation will support our current work and help to expand funding to new initiatives with other partners. Please donate or consider a tribute to honor someone or mark an occasion. We will send a note to acknowledge your tribute. 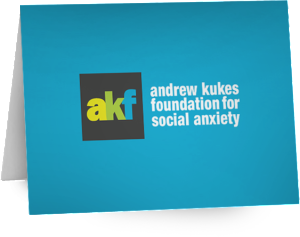 The Andrew Kukes Foundation for Social Anxiety is a non-profit 501(c) (3) tax-exempt organization. EIN # 27-2544635. You can view our listing on IRS.gov here.